We hit the road at 7:30 am on Saturday morning. Traffic light for a weekend. We encountered lots of smoke near Clinton and drove through town just as the morning fire briefing was winding up. We saw one campground with a sign saying closed for the season. Not sure whether that was related to the season or other economic pressures. 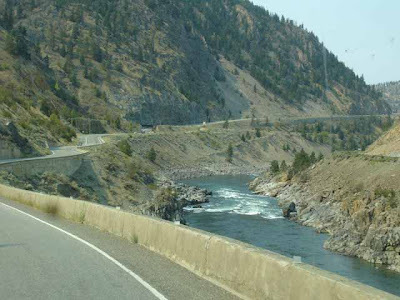 The drive south on Hwy 1 through the Fraser Canyon was very scenic. Unfortunately, there weren’t many places for two large motorhomes with toads to pull off the road. Hell’s Gate near Boston Bar looked to be busy but again parking was an issue for us. 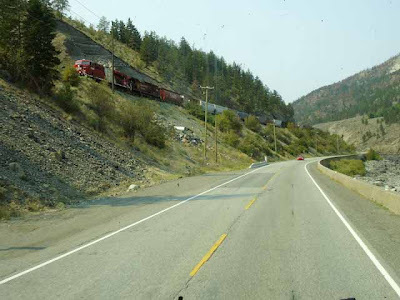 Hell’s Gate Air Tram stretches across the Fraser Canyon and looks to be a fun ride. It is only an hour drive back up the canyon from our campground at Thousand Trails Cultus Lake so we’ll have to go back for sure. The drive from Hwy 1 to our campground took us right through part of Chilliwack and Cultus Lake. Things were a little tight in places but we made it into the campground without incident. Lots of people here for the last weekend in August too but we managed to find two nice sites side by side. Norm, the ranger, addressed me by my first name when we arrived which I found a little surprising until he told me that a huge box containing our new Datastorm internet satellite had arrived for me last week. They had stored it in an office and it was alright there until Armand, our installer, arrives from Ontario on Sep 9th. We were very surprised but also thankful that it had arrived so quickly. Setup went well for both of us, although our Kingdome satellite can’t get a good signal because of all the mountains and trees blocking the signal. We’ll take the view any day. Hopefully, that will be rectified with the new addition. I expect the campground will begin clearing out a little on Monday as people return to work. We did manage a game of pickleball across the road in a park model park that apparently used to belong to Thousand Trails. We have learned that some of the local long term residents here, were a little ticked when TT sold off that park a few years ago without any consultation with local campers. $600K is what we heard, which is a steal given the location of the property. After supper, Jim and I showed the girls the finer points of coming back from a 2000 point first hand deficit in canasta. Sunday was spent washing and cleaning our motorhome, inside and out.and getting rid of two months of Alaska grime. Chris tackled the inside while I did the outside. The girls also went out for some groceries in the afternoon and then we all sat down to a wonderful BBQ burger supper outside. Dessert and coffee in front of our outside TV watching the movie Calendar Girls. Life is good. 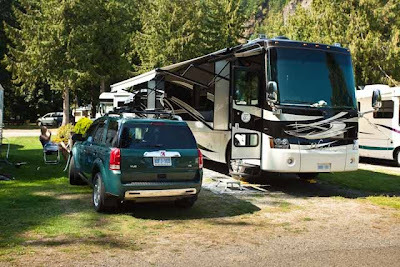 This entry was posted in British Columbia, Campgrounds, Internet, Phaeton, Photography.